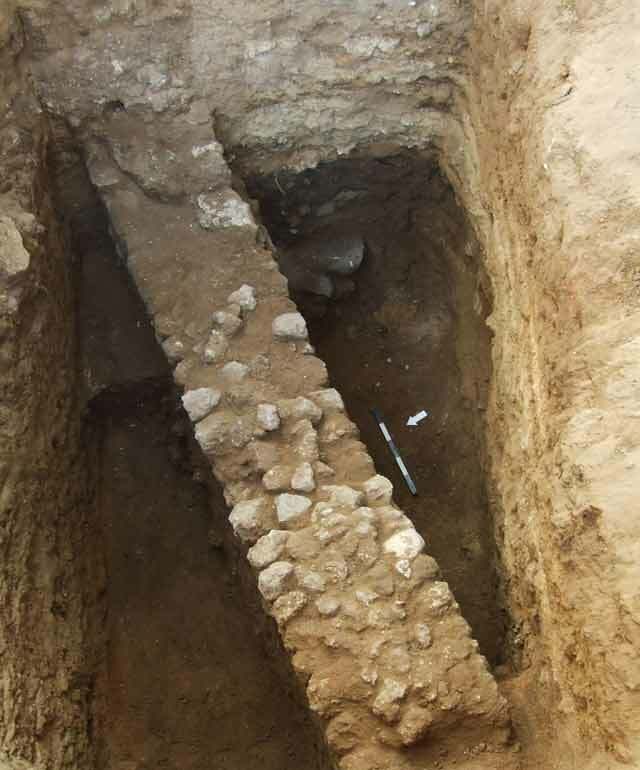 In July–August 2015, a salvage excavation was conducted on Louis Pasteur Street in Yafo (Permit No. A-7423; map ref. 176639–828/662190–268; Fig. 1), prior to infrastructure work. 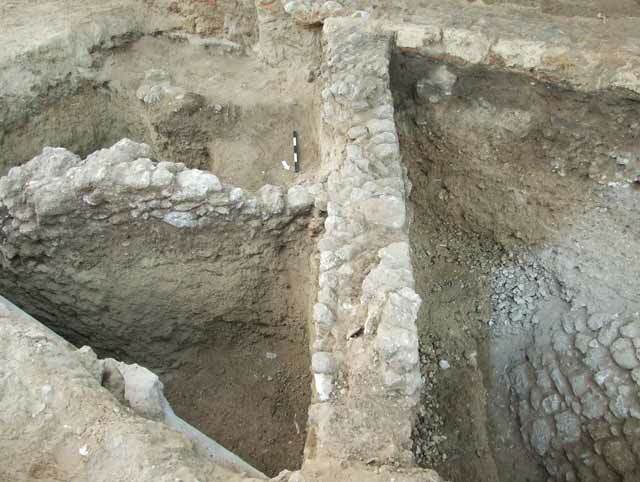 The excavation, undertaken on behalf of the Israel Antiquities Authority and funded by Ha-Mishlama Le-Yafo, was directed by Y. Arbel (field photography), with the assistance of Y. Amrani and E. Bachar (administration), L. Rauchberger and T. Rodin (area supervision), R. Liran and R. Mishayev (surveying and drafting), A. Dagot and C. Ben-Ari (GPS). A. de Vincenz, E.J. Stern and G. Finkielsztejn (ceramics), B. Ouahnouna (glass), R. Kool (numismatics), I. Ktalav (mollusks), D. Abu Salah (translation of Arabic inscription), T. Uriel and A. Ophir (youth counselors), M. Ajami and D. Barkan. Louis Pasteur Street extends across the southern margin of Tel Yafo, parallel to the course of the Ottoman city wall. 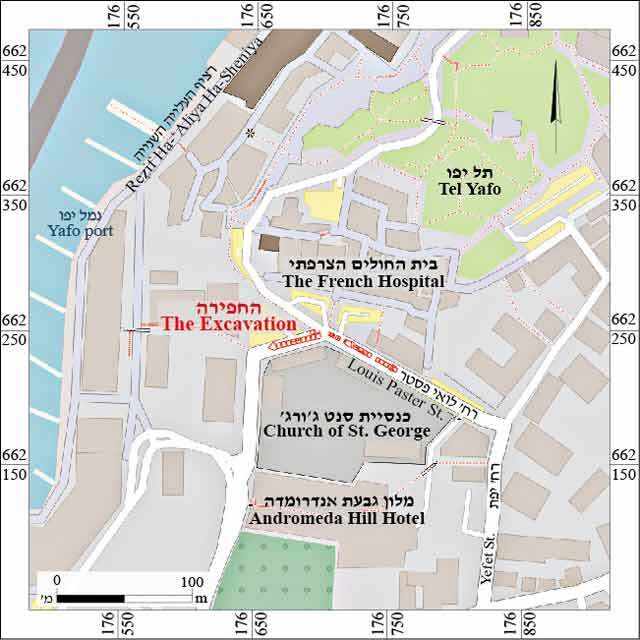 According to historical photographs and maps from the second half of the nineteenth century CE, after Yafo’s city walls were dismantled, a dirt road descending to the port passed through the site; buildings were located to its north, and the Greek Orthodox compound was situated to its south. The current street was paved under the British Mandate to facilitate access to and from the port. A previous excavation carried out along the northern side of the street yielded pottery sherds from the Persian and Hellenistic periods at a depth of 2.5–3.0 m (Ritter-Kaplan 1982). Dozens of tombs from the Persian–Hellenistic and Roman periods were discovered on Andromeda Hill, south of the eastern part of the street (Avner-Levy 1998). Tombs from these periods, the Late Bronze Age and Byzantine period were exposed in the French Hospital compound, across the street from Andromeda Hill (Re’em 2010; Dayan and Levy 2012). Remains of a fortification, buildings and installations from the Byzantine, Early Islamic, Crusader and Ottoman periods were also found at this site. 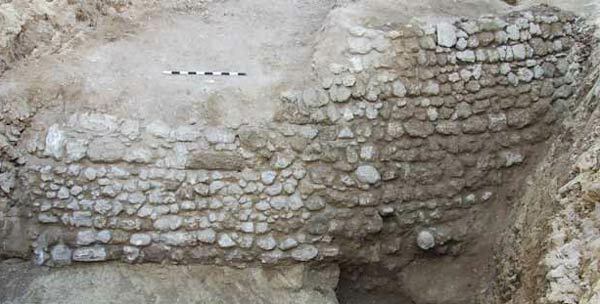 A concentration of dozens of jars from the Byzantine period and a segment of the perimeter wall of the Greek Church compound were exposed on Ha-Migdalor Street, which is the southern continuation of Pasteur Street (Haddad 2015). Some thirty squares were excavated in three areas (A–C; Fig. 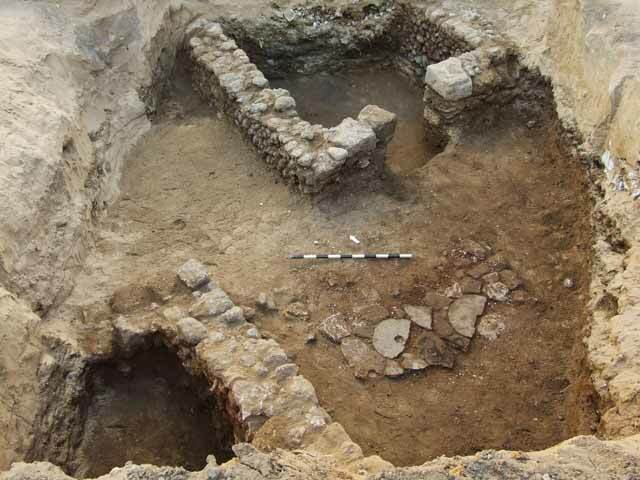 2), revealing building remains from the Early Islamic, Crusader and Ottoman periods, as well as numerous pottery sherds and fragments of glass vessels from the Persian, Hellenistic and Byzantine periods devoid of any architectural context. Persian–Hellenistic and Byzantine Periods. The Persian-–Hellenistic periods are represented at the site by scattered potsherds, mostly in deep levels, mixed with pottery sherds from later periods. The pottery includes a variety of local and imported vessels, including stamped handles of imported amphorae. A layer of ash exposed in one spot above bedrock included burnt bones; the majority were identified as animal bones, but some could not be clearly identified. A settlement hiatus following the Hellenistic period was discerned in the area. The Roman period, when the urban area of ​​Yafo was greatly reduced (Arbel 2017:70), is not represented here at all. The finds from the Byzantine period did not include any structures, but they did include an important ceramic assemblage, in which fragments of bag-shaped jars were prevalent. These jars were more common in the western part of the road, near Ha-Migdalor Street, where, as mentioned, a concentration of jars from this period was unearthed. These finds presumably represent the limits of the assemblage’s distribution. Early Islamic Period. 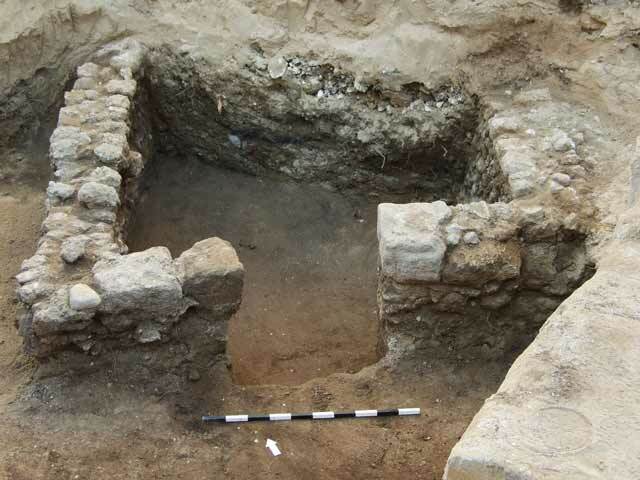 Parts of two adjacent structures, possibly residential buildings with a courtyard separating them, were discovered at the eastern end of the street; they were apparently constructed in the Abbasid period (Figs. 2, 3). The side walls of the rooms were built of small fieldstones bonded with soil, whereas larger, partly dressed stones (Fig. 4) were utilized in the façades where the openings were set. 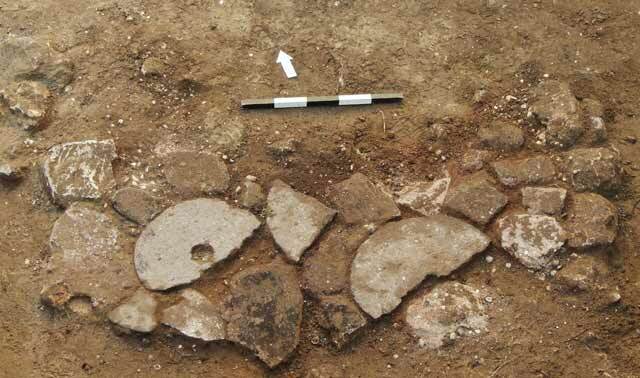 The floors of the buildings and the courtyard were paved with tamped earth, except for a small surface with a stone pavement in the center of the courtyard; the pavers included fragments of round basalt hand mills (Fig. 5). The ceramic assemblage recovered from the floors of the buildings and the courtyard dates mainly from the Early Islamic period, although several pottery sherds from the Crusader period were also found. These point to the continued use of the buildings during this period, at least in its early phases. A similar continuity in the ceramic assemblage was noted in similar buildings exposed in the nearby compound of the French hospital. The buildings at both sites were found covered with a collapse. Crusader Period. Sections of two walls (W126, W141) built of small, unworked kurkar stones in dry construction, were exposed in Area A. The walls, preserved only one course high, were discovered in various places and at different elevations, and thus no architectural connection could be discerned between them. The ceramic finds from accumulations associated with them did not include any sherds that postdate the Crusader period. Two walls exposed in Area B (W209, W220; Fig. 6) were built of unworked or partially dressed kurkar stones that were similar in size, material and construction style to the walls of Crusader-period dwellings discovered elsewhere in Yafo. In a layer of ash found in the corner between the walls were fragments of brown-glazed cooking pots, characteristic of the Crusader period (Fig. 7). The foundation of a broad wall (W318; Fig. 8), built of tightly packed, small- and medium-sized fieldstones, was found at the western end of Area C. The foundation was rather wider than other foundations of residential buildings known from the Crusader period in Yafo, but were too narrow for use as fortifications; hence, they may have belonged to a villa or a public building. A robber trench attributed to the dismantling of the wall was identified in the square’s eastern balk, where the wall had been exposed. In the center of Area C were the remains of a circular, stone-built installation (L325) covered with ash. Inside the installation were numerous pottery sherds and glass fragments and three arrowheads from the Crusader period. There were also several pieces of slag, perhaps indicative of an industry; it is possible that arrowheads were manufactured or recycled here. Along with ceramic assemblages of storage vessels, tableware and cooking vessels that were common during this period, nearly forty fragments of handmade vessels decorated with brown-red geometric patterns were found. These vessels first appeared in the twelfth century CE, and were more widely distributed during the Mamluk period. Most were found at the eastern end of Area A, alongside the fragments of imported glazed bowls from the Crusader period, thus allowing us to date them to this period. This is the largest number of such sherds to be found so far in one excavations site in Yafo, and it is even greater than the total number of such items documented to date in all the excavation sites in the city. An unusual slanting wall (W218; height c. 3 m; Fig. 9) constructed against a massive soil fill (Fig. 2) was revealed in the western part of Area B. It was built mostly of medium-sized, roughly cut, kurkar stones (average length 0.2–0.4 m), although a course of larger, well-dressed stones was found in the southern part of the wall. The quality of these stones may be the reason that the upper courses of the latter wall segment were plundered, as evident in a robber trench noted the balk. The wall survived fourteen courses high. The lower course was founded on bedrock, and the upper one supported a surface built of small fieldstones; this probably indicates the original height of the wall. The layers of earth that sealed the wall to the east were probably an intentional fill meant to seal the wall after it was no longer in use. The artifacts recovered from these layers included pottery sherds that span the periods from the Hellenistic through the Crusader, but mainly from the Islamic and Crusader periods. Sections of Crusader buildings were exposed above the fill (above). In light of the striking similarity between this construction and the glaçis exposed in the French Hospital compound (Re’em 2010), it seems that the wall was part of a fortification, possibly a glaçis or the side of a moat. In the absence of any sealed finds, the wall cannot be dated accurately. A fragment of a Corinthian capital incorporated in the wall and sherds from the thirteenth century CE from the building complex that sealed the wall indicate a time frame between the end of the classical periods and the thirteenth centuries CE for the construction of this wall. This date for the fortification wall is corroborated by its stratigraphic location and its great similarity to the Crusader fortification segments unearthed in the French Hospital, which dates from the twelfth century CE. Late Ottoman Period. 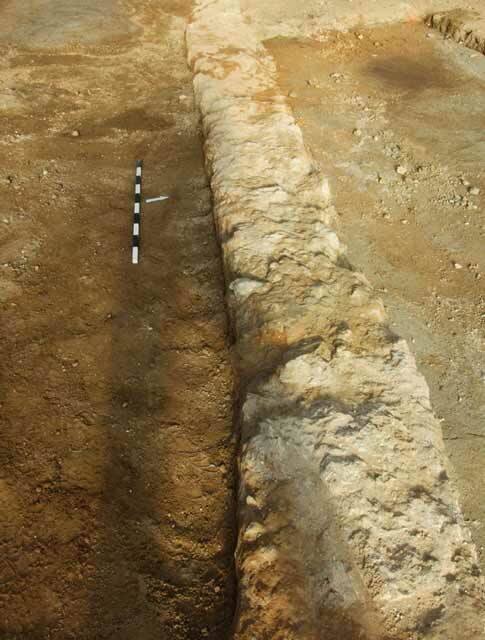 A section of a wall delineating ​​the Church of St. George was discovered along Areas A and B; this is the continuation of a wall segment exposed in the excavation along Ha-Migdalor Street (Haddad 2015). The wall (max. width 0.5 m; Fig. 10) was haphazardly constructed of fieldstones of various size that were reinforced with clay—a prevalent building method in the late Ottoman period in Yafo. The two parts of the wall formed an obtuse angle at the boundary between Areas B and C, which is clearly reflected in the wall’s course on the 1876 Sandel Map (see a copy of part of the map in Kark 1990:299, and a complete picture in Shacham 2011:158). 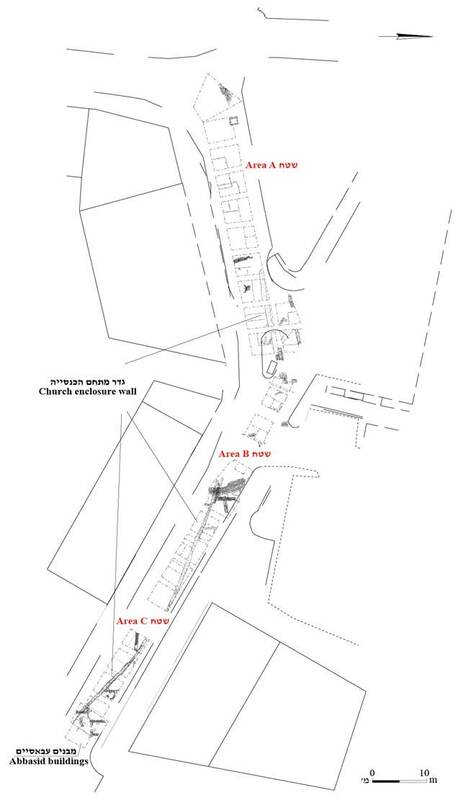 The revealed course of the wall indicates that the church compound originally extended into the area where eventually Pasteur Street was paved, and that the boundary of the compound was moved slightly southward when the street was paved. Historical photographs show graves in the courtyard, but no burial remains were found in the excavation. A gravestone in the current church courtyard marks a mass grave, where, according to the inscription it bears, were reinterred the bones of individual graves that were dug up during the years 1840–1916. It seems that if any graves were in the area where the street was paved, they were removed in 1916, following the Ottoman decree which prohibited further burials in the old cemeteries that blocked the development of the city; the Ottoman authorities even destroyed several of these cemeteries in order to connect the city with the neighborhoods that developed along its outskirts (Kark 1990:299). 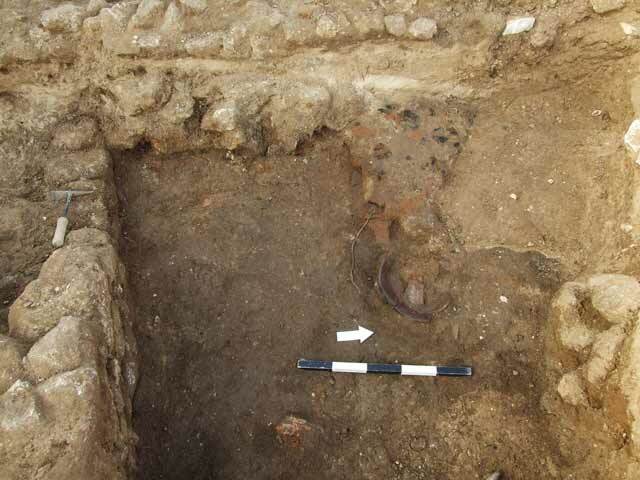 Remains of a sloping retaining wall (W144) were discovered at the western end of Area A. One face of the wall was exposed, and the other face remained hidden, as it retained an intentional fill of tamped soil and hamra, which contained a large fragment of a roof tile manufactured at the Roux Brothers factory near Marseilles. Such roof tiles were common in the Land of Israel, especially in the last decades of the nineteenth century and the first decades of the twentieth century CE (Ayalon 2002). Close to the street level and not far from the retaining wall was a square installation (L146), possibly a cesspit, built of dressed building stones in secondary use. Potsherds from the end of the nineteenth or the beginning of the twentieth century CE were found in the soil accumulations within the installation and beside it. The finds from the Ottoman layer comprised a variety of local pottery vessels, as well as fragments of imported bowls, including porcelain bowls or bowls made of glazed clay that resembles European porcelain; production stamps of French factories appear on several of the bases. The assemblage also contained several tobacco pipes from the eighteenth and nineteenth centuries CE, roof tiles, tiles and bricks manufactured at Roux Bros. factory that operated at St. Henri near Marseilles, fragments of glass bracelets, beads, lead fishing weights, bone and metal objects, musket balls and fragments of cannonballs. The assemblage is characteristic of late Ottoman strata in Yafo. The primary contribution of the excavation is I obtaining additional information regarding the expansion of the city southward over the years. The ceramic finds from the Persian–Hellenistic period are similar in quantity and character to those found at many excavation sites in Yafo beyond the limits of the tell, and are consistent with the location of the street along the edge of the necropolis on Andromeda Hill and its vicinity. The numerous fragments of Byzantine-period jars, especially in the western part of the street, are linked to the activity that took place in the port. During the Early Islamic period, the city’s residential quarter spread to the higher area of the street, in the east, and this settlement continued into the Crusader period. In the twelfth century CE, the area where the street runs nowadays became part of the city’s fortification, but these fortifications were removed in the thirteenth century for the construction of residential buildings. In the second half of the nineteenth century, following a long hiatus spanning the Mamluk and early Ottoman periods, part of the area was incorporated into the compound of the Church of St. George. Toward the end of the Ottoman period, the church compound was reduced in size, and the street was laid, probably as a dirt road. The street was paved for the first time during the British Mandate to allow an efficient flow of traffic to the port. Arbel Y. 2017. Salvage Excavations in Jaffa’s Lower Town, 1994–2014. In A.A. Burke, K.S. Burke and M. Peilstöcker eds. The History and Archaeology of Jaffa 2 (The Jaffa Cultural Heritage Project series 2; Monumenta archaeologica 41). Los Angeles. Pp. 73–88. Avner-Levy R. 1998. Yafo, Yefet Street. ESI 18:55–56. Ayalon E. 2002. Marseilles Roof Tiles and their Imitations in Israel. In. E. Ayalon and S. Sharif (Safadi). Hidden Palaces: Wall and Ceiling Paintings in Ottoman Palestine (1856–1917) (Eretz Israel Museum, Catalogue). Tel Aviv. Dayan A. and Levy Y. 2012. Yafo, Eden Hotel. HA-ESI 124. Haddad E. 2015. Yafo, Ha-Migdalor Street. HA-ESI 127. Ritter-Kaplan H. 1982. Yafo, Pasteur Street. HA 78–79:48 (Hebrew). 3. The buildings and the courtyard from the Early Islamic period, looking north. 4. The façade of the northern Islamic-period building, looking north. 5. Part of the courtyard pavement between the buildings, looking north. 6. The corner formed by Walls 209 and 220, looking south. 7. A layer of ash containing fragments of a Crusader cooking pot, looking west. 8. Wall 318, looking east. 9. The fortification, looking west. 10. A section of the wall surrounding the compound of the Church of St. George, looking west.